The coffeecognoscenti have been trying to wean us off our milk dependency for a while. Thanks to guys like Gwilym Davies at Prufrock, Londoners are slowly being weaned off their vente milky hazelnut lattes onto shorter milk-based drinks like flat whites and stumpys …then to cortados, macchiatos, piccolos and gibraltars and finally to milkless expressos and ristrettos. Tapped and Packed were the first in London to focus more on their drip coffee than espresso using a variety of extraction methods on freshly ground high quality single origin coffees. They use filter, siphon, cafetiere and aeropress as well as an espresso machine for blends and single origin beans. Highly recommended, get yourselves down there. Today Square Mile Roasteries finally opened a pop-up outlet, it has reportedly long been their dream, and what an outlet. The place is called The Penny University in deepest Shoreditch and is open daily. They serve only coffee. Only carefully chosen extraction methods of gourmet single origin. When I visited I sat at a bar and enjoyed a leisurely coffee experience. The menu included four coffees – each to be prepared by a single method. 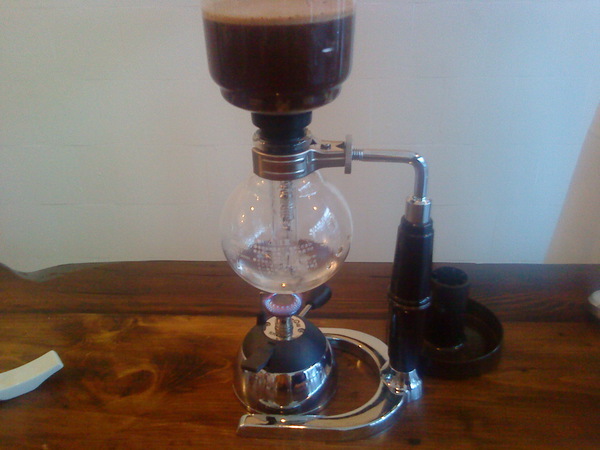 I chose the Ethiopian Yirgacheffe which is made via a siphon. I was encouraged to smell the fresh ground beans – such an aroma and I passed the small tin to the company present. The coffee was then made in front of me using a method which, to the uninitiated, might look something like a chemistry lab experiment. I was told to leave it for five minutes before drinking. That was good advice, the flavour was exquisite. I’d had a Union Yergacheffe which was peppery, refreshing and citrusy on my first visit to Tapped and Packed but the Yirgacheffe here was quite different. It was rich, not peppery at all, but with many flavours including citrus and an almost bergamot-like taste. The coffee, while rich in flavour had some of the qualities of a fine tea. I was given a small flask of water and a glass and the whole experience was one which centred around the quality of the coffee. The cafe (if such a word suffices) was beautiful in its wooden interior and the who’s who of coffee were in attendance. The Penny University is the epitome of where the coffee experience in London has been heading and will long remain a special venue for coffee geeks like me. Superb. There is also a tasting menu where for £8 (minimum two people) you are led through the four different coffees and extraction methods accompanied by specially chosen chocolates. By the way. The original penny universities were 18th century London coffeehouses where, for the price of a penny entry, punters could drink as much coffee as they liked while the latest news, pamphlets, bulletins were distributed and discussed and patrons could philosophise at length. This entry was posted in eating and drinking, london and tagged coffee, espresso, london, shoreditch, siphon, square mile, yirgacheffe. Bookmark the permalink. Monmouth have been doing filter for a good couple of years and I believe Dose have been doing Non espresso coffee for awhile mainly aeropress I think. But regardless it is a exciting step. Indeed. And I was remiss not to mention them. Monmonth has done drip coffee for ages and their team does a great job. Dose is one of the best places. I don’t make it there often, despite living not too far away, due to their restricted opening hours. I forgot they were offering aeropress. I still love a latte by the way! Especially in the morning and especially at Exchange Coffee. A nice writeup Phil and it was great to share the experience with you too.